Throw the dice and shuffle those cards, it's Game Night. This delivers hours of fun with the biggest assortment of games yet. 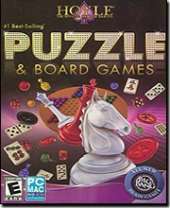 This great collection features traditional game standards like Hangman, Mahjongg, Dominoes, Checkers, Chess and Anagrams plus popular hits like Chess, Battling Ships, Yacht, and Suduko. Challenge your friends and family on one computer or play against the witty and personable HOYLE characters. All games are designed with rules according to HOYLE, the Official Name in Gaming. HOYLE Highlights: HOYLE Face Creator to design your own player; Customize card backs, characters and more; HOYLE rewards to unlock fun game bonuses. You can play against opponents via email or animated computer opponents, it's your choice.